The beginnings of the traditional Japanese tattoos known today as ‘wabori’ date back to the 18th-19th centuries, during the Edo period in Japan. There is a theory that people in Japan had a custom of producing tattoos known as ‘irezumi’ as early as in Jomon period ( between 14,000 BC–300 BC) which were similar to the traditional tattoos of the Maori and Fijian people of the Pacific islands. Tattoos also existed as a custom for the Ainu, indigenous people in the north of Japan, and the Okinawans in the south. However wabori as it is referred to today has different roots from those native customary tattoos. In the beginnings of wabori the tattoos were a trend among prostitutes and were known as ‘ire-bokuro’. In the early 17th century, prostitutes in the Osaka-Kyoto area started a trend called 'ire-bokuro' as a personal expression of loyalty to their customers and lovers. As it can be seen from the word ‘hokuro’ (mole), which is a part of the compound word ‘ire-bokuro’, the custom began by using a needle and ink to make a small spot on the skin. Prostitutes would get a spot between the thumb and forefinger, where lovers thumb hits when they hold hands, or as many spots as lover's age on their arm. Before long, they began to get tattoos on their upper arm mainly with their companion’s name such as ‘(someone’s) forever’ or ‘(someone’s) wife’. As such, the custom ire-bokuro continued, and subsequently developed further and spread to Edo (old name for Tokyo). 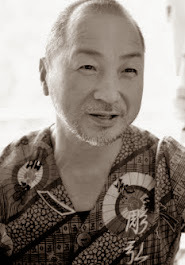 By this point in time, several decades after the custom of ire-bokuro began, a 'chivalrous' type of man began to get written characters tattooed on their arm or back as an expression of loyalty to Buddha and the Shinto gods or to express self-respect. For example, by getting tattoos of a line from a Buddhist text such as ‘I sincerely believe in Amitabha’, they were expressing that they possessed convictions such as religious piety, a resignation to death and no fear of dying. This style continued for these 'gallant - macho' from before 18th century to afterwards, and at the time one could begin to see that many young men who wanted to show their strength had characters written on them. By the 18th century, such tattoos that were done for these men’s pledges of loyalty were not only written characters but by then there were also images. These were similar to small tattoos commonly seen in the West. Designs on men’s arms and backs, such as dragons, legendary figures, Buddhist monks and scenery began to emerge. As the style changed from written characters to images, the meaning of tattoos also changed from expression of devotion to the Shinto gods and Buddha to 'manly coolness’ and more casual ‘show-off’ tattoos. This kind of tattoo was extremely common among young men in Edo, particularly those who worked partially naked such as construction workers. It became so popular that it is said that it was banned. From that time onwards, Japanese tattoos began its development as wabori. Towards the end of the Edo period many young men began to get various 'one - spot' tattoos. At the beginning of the 19th century the Chinese fantasy novel ‘The Water Margin’ was translated into Japanese and colour prints of the story were introduced to the people of Edo. ’The Water Margin’ is an exciting story with plenty of thrilling action from 108 heroes who help the weak and frighten the mighty. The heroes of the story had various tattoos on their bodies, such as dragons and flowers. 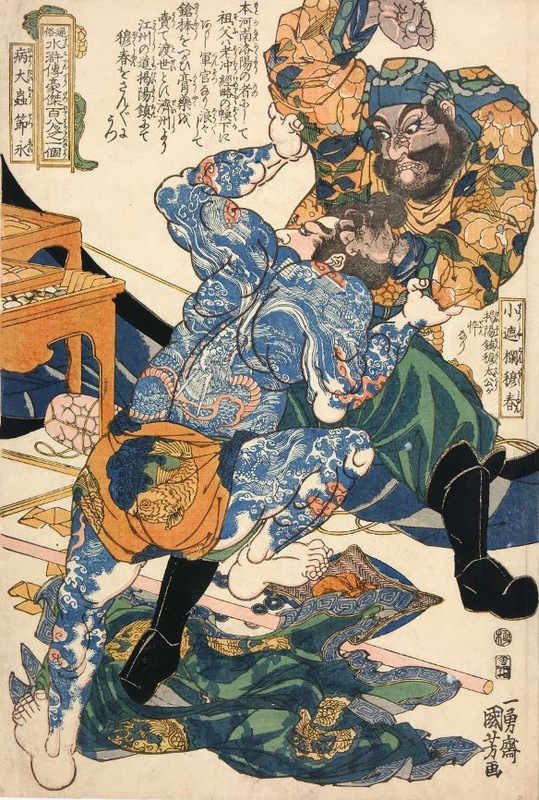 Several versions of ‘The Water Margin’ were produced by novelists and Ukiyoe artists, but it is said that it was ‘The Popular 108 Heroes of The Water Margin’ Ukiyoe series by Utagawa Kuniyoshi that had a particularly large influence on tattoos. This bold composition of warrior prints has such lively motion with heroes whose backs are covered in beautiful tattoos. The prints were enthusiastically received by the people of Edo whom it appealed to as being interesting and exciting. 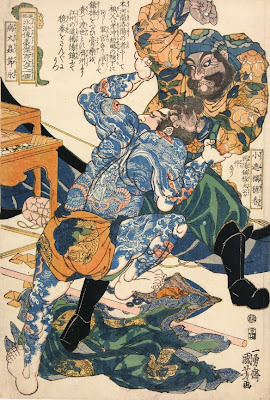 In an era where Ukiyoe provided amusement for the masses, like TV and comic books do for people nowadays, the heroes of the Water Margin were like popular pop stars and anime characters to the young people of Edo. They had a yearning for stardom and wanted to be cool like fictional characters just like the young people of today. The young men of Edo imitated their popular idols to be ‘stylish’ and ‘sophisticated’ by competing with each other by getting tattoos. This trend intensified and there was a tendency for people to say “if a man doesn’t have tattoos he’s uncool”, for example, in the red light district of Yoshiwara, they would hire men with tattoos, and it’s said that the rate of their salary depended on whether their tattoos were good or not. In other words, a good tattoo gave them status. Therefore wabori and full-body tattoos established a Japanese style of tattooing and their beauty also attracted the attention of Westerners that visited Japan. Kansai region wabori are different to those of the Kantou region (Eastern half of Japan including Tokyo) in the way that there are not many lines and the style has a focus on shading. There is another difference in the shape of the edges of the tattoos that is referred to as “separating”. A lot of Kansai tattoos have edges shaped like flower petals or a waveform. However, the distinction between these ‘Kantou wabori’ and ‘Kansai wabori’ is not very prominent as Japanese tattooists from around the country and around the world have a mutual network, and they each establish their own individual styles.